My daughter was one year old when she first celebrated Lois Ehlert's birthday in 2013. 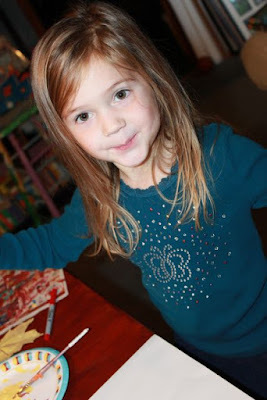 Every year since our family has found a way to create something together based on one of her books. This morning, it felt important to me to take the time to celebrate once again. 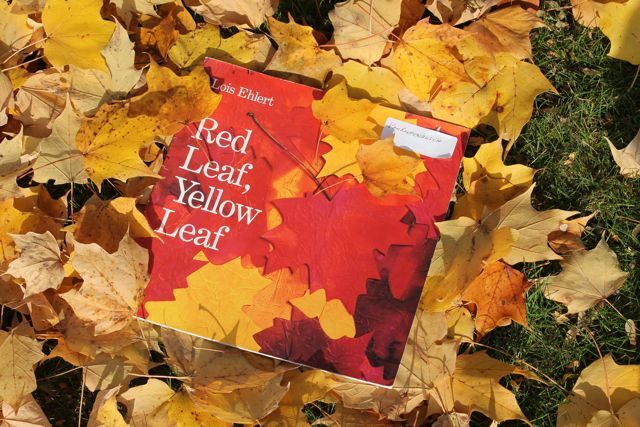 Red Leaf, Yellow Leaf was the perfect book for 2016. This is the first time I can remember the maple tree in our front yard still having leaves this late in November. 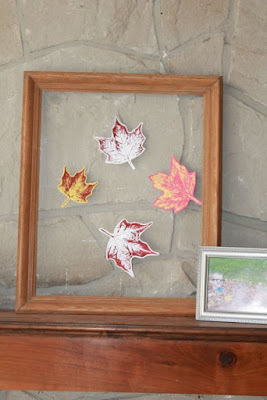 With the leaves still on the ground and not raked to the curb we found inspiration for a fun project. First we read Red Leaf, Yellow Leaf under the tree. 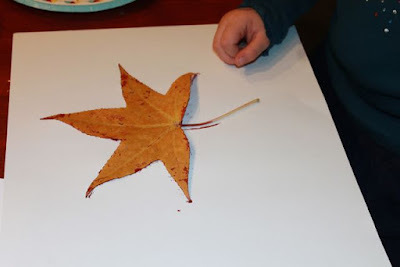 Then we found a few really good leaves to take inside to make leaf prints. All of my children were home from school today because of Election Day. 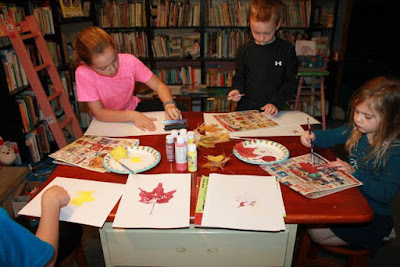 My children painted the backside of the leaf and stem with acrylic paint. 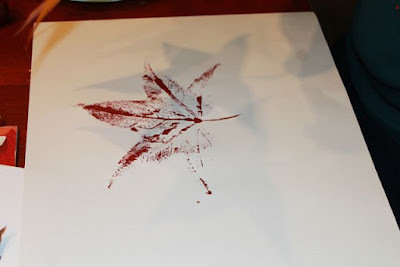 The leaf was pressed onto the paper to make the print. 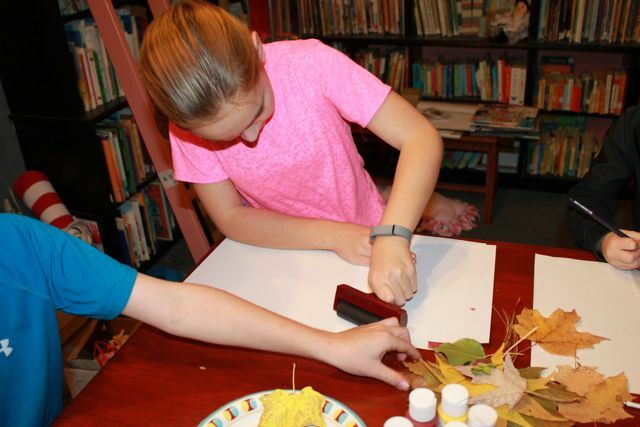 They enjoyed using the brayer. My son carefully painted the back of his leaf to make sure the print would be just right. 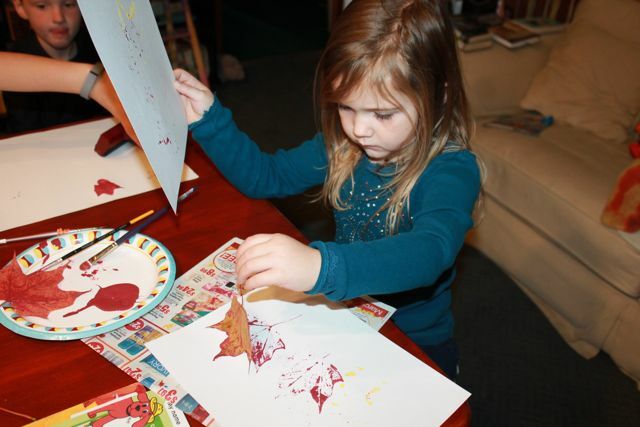 I provided red and yellow paint because of the book. I was surprised someone didn't ask for purple or pink! My son labeled his leaves; small, medium, and big. 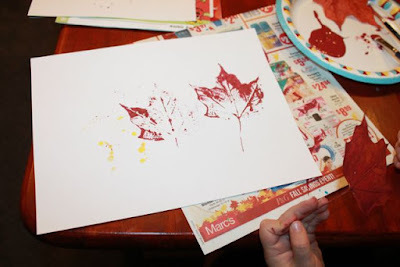 After putting the leaf paint-side down on a piece of paper, we placed a piece of scrap paper on top and then rolled the brayer over the leaf. Two suggestions -- 1. 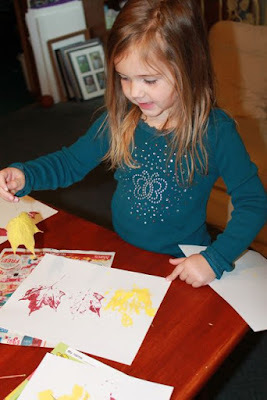 Have lots of scrap paper on hand because they will get covered with paint and you will not want to use them for the next print. 2. You do not have to press hard on the brayer. Pressing too hard will squish the paint. 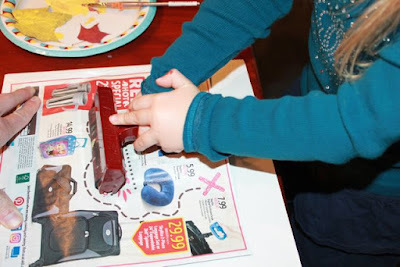 After rolling the brayer, remove the scrap paper. Then, carefully lift the leaf to reveal your print. She was quite pleased with the results. 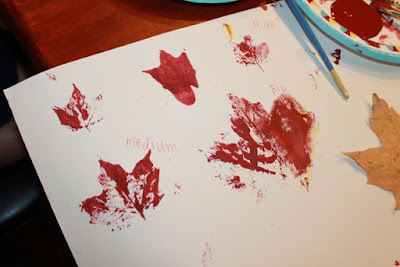 We did many leaf prints. I wanted to do something cool with them. I thought about making cards or making garland. 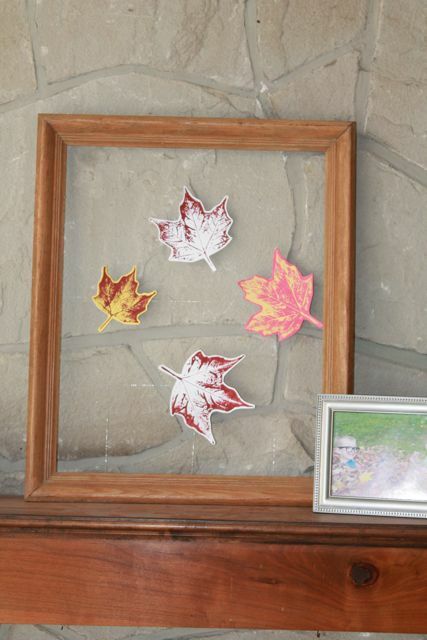 But then I found a picture frame and had an idea. 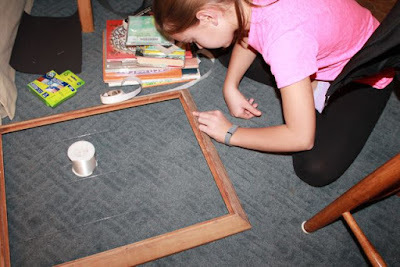 We taped fishing line in grid pattern and then taped our leaf prints to the fishing line. 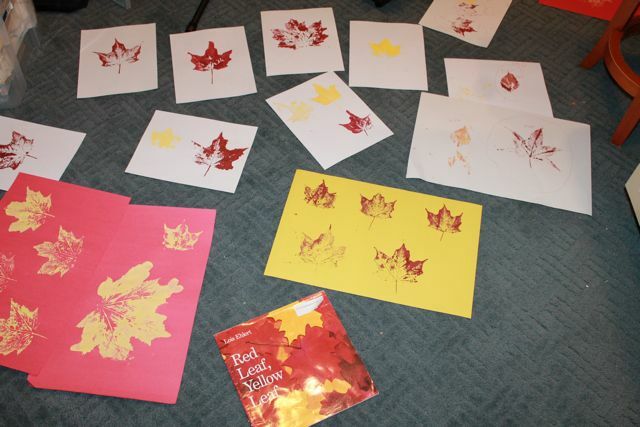 We will have falling red and yellow leaves until the holidays! 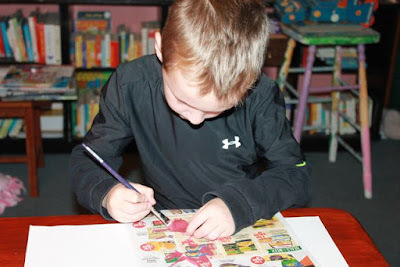 Happy Birthday, Lois Ehlert. 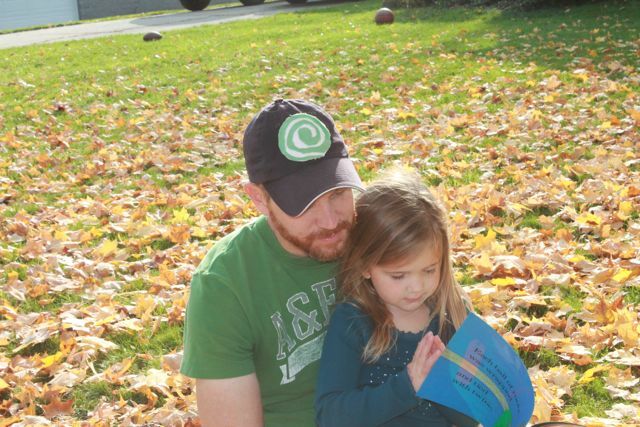 Thank you for writing books that have brought my family together for the last four years!